As the winter season rages on, we begin to look forward to the start of the spring and the collegiate sports that come with it. Perhaps the most notable is the Providence College Softball Team, led by new Head Coach Jill Karwoski. The Friars are looking to bounce back from a somewhat underwhelming 2018 season, ending with an overall record of 13-32. The primary change from last season is the difference in team management. The Friars said goodbye to longtime prior Head Coach Kerri Jacklets, who served in the position for a staggering total of 13 seasons with the College. In her time as head coach of the Friars, Jacklets was able to produce 15 All-Big East selections, one All-Big East Tournament Team player, three All-Northeast Team selections, one College Sports Madness Big East Rookie of the Year, and one NFCA All-Region Team player. Another development from last season is the change in experience. Last year, the Friars had a relatively young squad. With only four seniors on the roster, PC fielded as many freshmen as they did seniors. This year, however, PC’s softball team features a total of seven seniors. This increase in experience will, no doubt, assist the Friars in improving their overall record. While PC softball only lost four seniors to graduation, they will certainly be missed. Such talents include Julianne Rurka ’18, who held the Friars’ highest batting average at .333, and Brittney Veler ’18, who led the team in RBIs, home runs, and second to most runs. 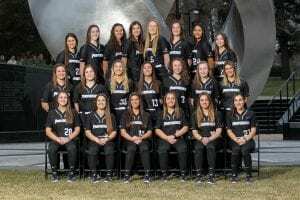 While these are enormous losses for the program, PC softball has much to look forward to with this relatively older team. Emma Lee ’19 looks to improve her already-stellar reputation from last season with the most hits, runs, and second to highest batting average on the squad. On defense, the Friars pitching staff features four relatively young players. The oldest of which is Miranda Trinidad ’20, who held the lowest ERA of all pitchers last season. I observed this team when they came to Clearwater after having not seen them in about three years. I observed many a positive change starting with the new head coach.. The culture seems so different for the better and the players seem to be just having fun. I know it’s early but I think they are going to be just fine.. The pitching looks good and the players seem to enjoy playing together… This is a very likable group. Hope to see a few more Clearwater games before heading north. Best of luck to what the future may hold.